This past weekend I stopped into Hartly Boutique in Westwood, NJ. It was my first time in the store, and it was such a treat. My eyes were feasting on the beautiful selection of designer pieces from Phillip Lim to DVF, Veronica Beard, Yigal Azrouel, Missoni, and Derek Lam (to name a few). When I first walked in I was immediately drawn to the back room which carries special occasion dresses. I spent a solid ten minutes swooning over Zang Toi's Spring 2016 collection, which was front and center as I made my way into the room. Hartly was hosting a trunk show for Zang Toi at the time I visited. If you are ever in the area, Hartly hosts trunk shows and designer events quite frequently. You can view their upcoming events calendar here. After browsing through their fall collection, I decided to style their Fringe Leather Jacket and Sleveless Mohair Turtleneck. It may have taken me a couple hours to finally select a few pieces because each time I turned to look through a new rack, I found another item that I loved! However, both of the pieces I chose are true fall staples. If only these photos could showcase just how soft this mohair turtleneck is, it's the perfect layering piece for the cooler months. Let's not forget to discuss the fringe details along the sleeves of this moto jacket. The ladies over at Hartly boutique certainly understand fine detail. I can't get over how futuristic and fun this jacket is. It can be worn casual over a white tee, or snapped at the collar and completely zipped for a more sophisticated look. It's exactly the kind of jacket you need in your wardrobe this season ;). If you are interested in browsing Hartly's fall collection, head on over to their online shop. Don't forget to give them a follow on Instagram and Facebook to keep up with the latest! I always feel somewhat limited when the cooler months roll in. The days of wearing strappy dresses and bright pops of cheery colors are long gone. My wardrobe now consists of a heavy rotation of neutrals, which I don't mind, but I do get a little bored of the same ol' combo. To mix things up, I've been incorporating shades of green into my outfits: emerald, olive, army, moss, and so on. These colors can be treated as a neutral or a statement piece depending on how you style them. 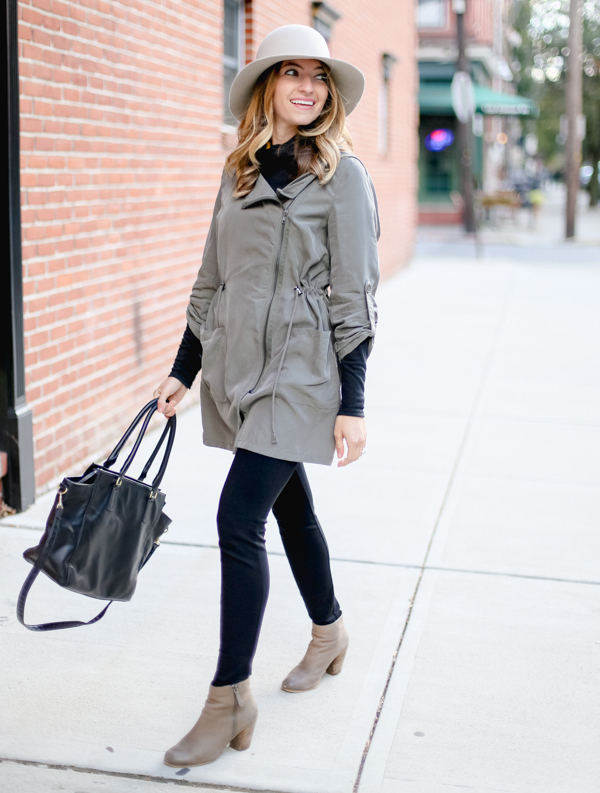 In this outfit, I wore a light olive green jacket paired with black and beige neutrals. I wanted the main focus to be on the jacket so I kept the rest of the outfit simple. I could have mixed in some prints or gold accessories to blend in the olive, but I felt this outfit was stylish enough all on it's own. I hope this look inspires you to incorporate more green tones into your outfits this fall. See more styles in the widget below and click directly to shop! 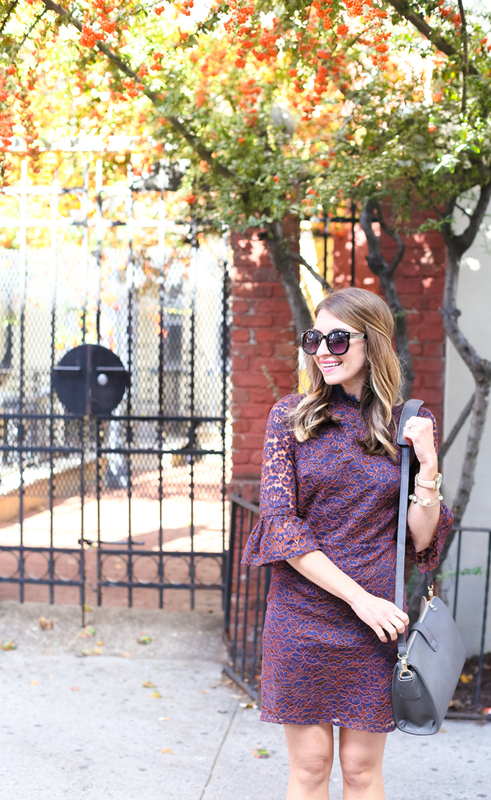 From bell bottoms to voluminous sleeves, it's clear the 70s are back in full swing for the fall season. When I first laid eyes on this bell sleeve dress from Topshop, I was instantly drawn to the scalloped neckline and intricate lace detail. I am a complete sucker for lace (if you couldn't tell). Originally, I purchased this dress for a fashion week event back in September, but it ended up pouring rain so I couldn't wear it. Although it was chilly this past weekend, I decided to wear this dress for a little date night with my fiancé. Things have been so incredibly hectic lately I've barely had the chance to have more than a 5 second conversation with him. It was so nice to cozy up, drink some fruity cocktails, and relax together. It was exactly the kind of weekend I needed. Now, back to the dress ;). If you aren't completely captured by the stunning open back and ruffled bell sleeves then I'm not certain what your heart is after. The details of this dress are so completely unexpected and daring. I can't wait to style it up later this season with over the knee boots and a cozy vest. Hope you have a speedy week! What's not to love about a cozy poncho sweater? The billowy wide sleeves and comfy fabric make it the perfect choice for this brisk fall weather. The trick to styling ponchos is to neutralize the rest of your outfit. Ponchos are traditionally rich in color and design, while at the same time they almost resemble a blanket. It's definitely a key piece for layering, but you don't want to overwhelm the look with anything too busy. I personally prefer a more streamlined bottom- think skinny pants, or in my case the new pixie pant from JCrew. Side note, these pants are heavenly. The stretchy fabric makes them completely comfortable, and they offer more structure than leggings. If I could wear them everyday, I would! I'm on the shorter side and totally understand that ponchos can be intimidating because they consist of a whole lot of fabric, but if worn properly they will strike the right balance of boho-chic. I dare you to cozy up and give this trend a try. 'Tis the season of layering. I love getting bundled up in a chunky sweater or big cozy scarf. The weather hasn't been too chilly lately, so I've been able to get away with layering a light blouse with my favorite slim boyfriend jeans. I live in these jeans year-round, they were one of the best denim investments I've ever made. 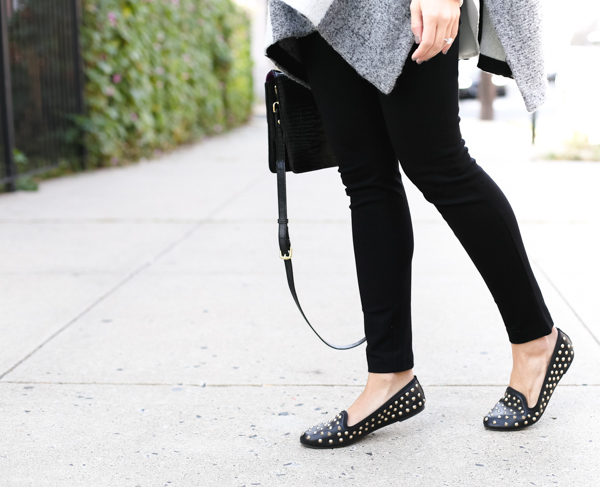 I get the most joy out of wearing them with ankle booties (stay tuned for that look). I've been slowly building my fall wardrobe by purchasing chic basics to act as my base layer. 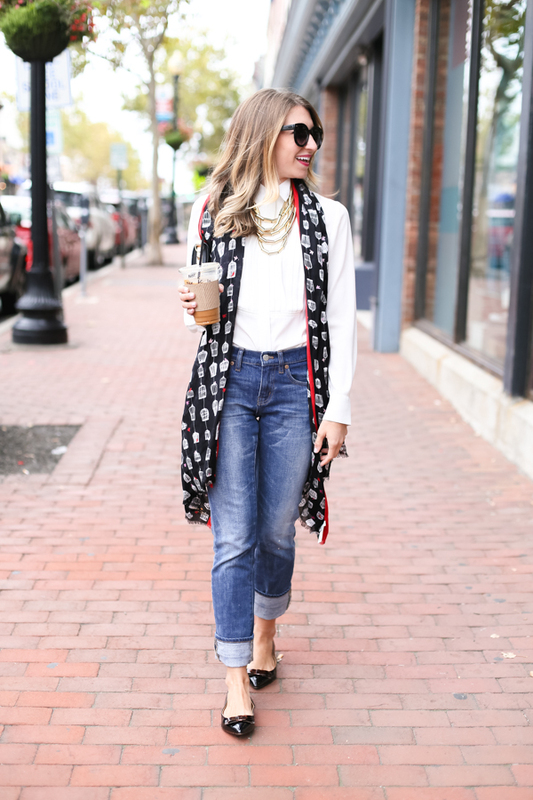 I love piling on scarves and statement accessories to transform the outfit. How gorgeous is this five-strand chain necklace from RomanLuxe? 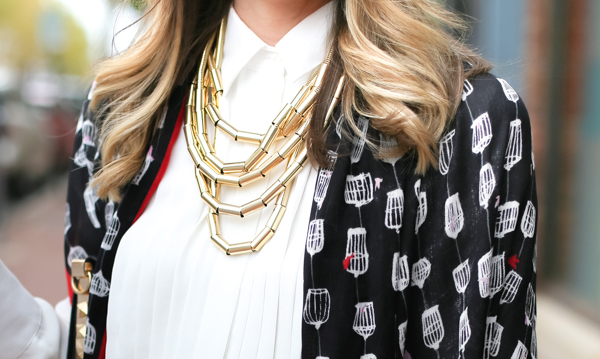 It's a modern take on the totally trendy bib necklace. Personally, this one caught my eye because of the shiny gold plated finish. It's so luxe looking and I receive loads of compliments each time I wear it. How do you layer up for fall? P.S. I want to give a special shout out to my beautiful blogger friend, Alina of Style by Alina, who has so graciously been a mentor to me over the past year. She inspires me every day with her beautiful photography and beyond stylish outfits. Most recently, she launched her own lightroom presets for bloggers. I tested them out in today's post and I honestly love them. It took me half the time to edit my photos. If you're a blogger and interested in learning more head on over to her Style Studio. There are many things we leave behind us when the summer season ends, but there are a handful of fashion trends that roll over with is. Floral prints happen to be one of those few seasonal styles that carry themselves from month to month. They take on a darker mood in the fall with deeper hues that scream romance. Of course it's still early in the season so I was able to pair this top with a flared velvet skirt sans jacket, but as the weeks go by you'll need to layer up with a moto jacket, tights, and boots. 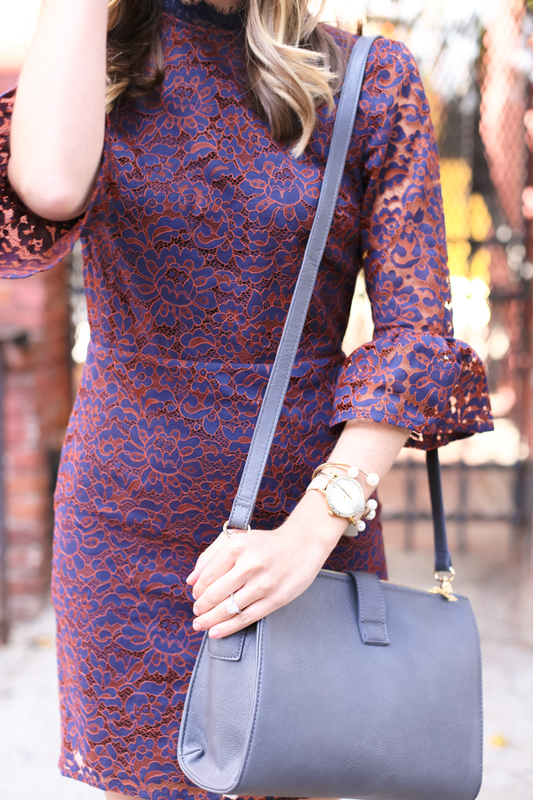 By pairing a long-sleeved top with a fall-inspired skirt, you can wear this look from the office to cocktails with friends. 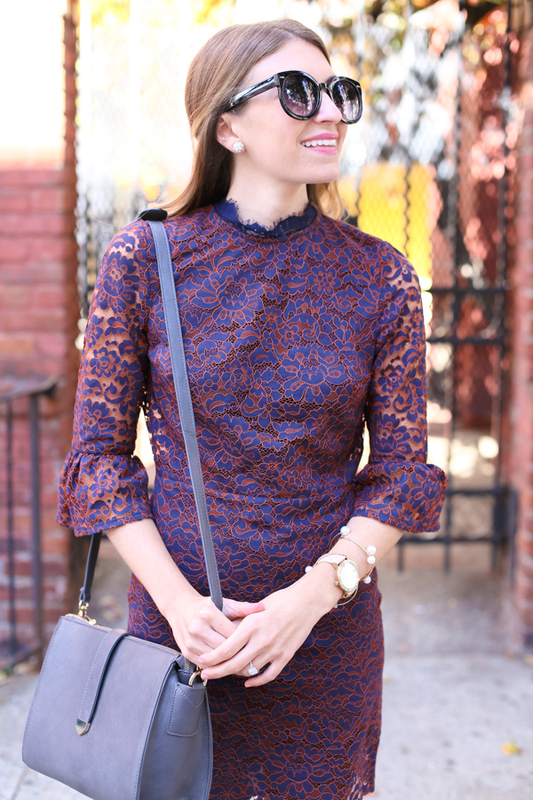 How would you wear florals in the fall?